Fact: Long drives can be really boring. And since many summer trips are road trips, most people are looking for ways to pass time in the car. You don't have spend a ton of cash on new gadgets to entertain your crew, though. Your own mobile devices - along with a few smart apps - can make the miles fly by. 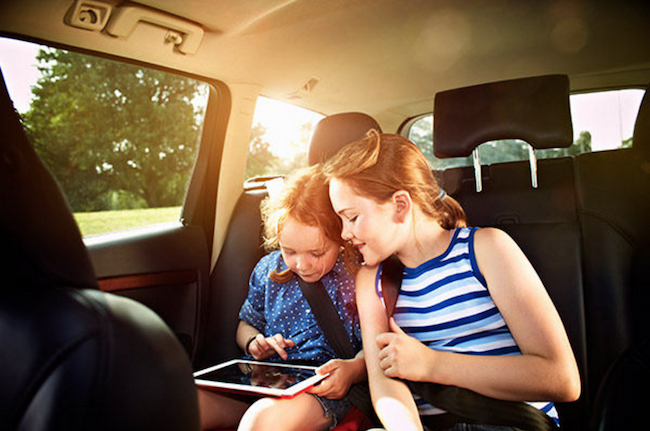 "Using individual tablets or smartphones means that everyone can watch - or listen to - whatever they want, which tends to make for a much more peaceful road trip," says Sam Abuelsamid, a senior analyst at Navigant Research. Read on for our top in-car entertainment picks. Audible has more than 300,000 audio programs available for individual purchase or as part of a monthly membership plan ($14.95; 30-day free trial entitles the member to one free audiobook). For free audiobooks, try OverDrive or hoopla digital, which you can use to check out titles from your local library. OverDrive gives you access to thousands of titles, while hoopla digital also offers movies and music. The whole car will enjoy the Five Minutes With Dad podcast, a show starring a seven-year-old, his four-year-old sister, and their thirtysomething dad discussing everything from a trip to the zoo to learning about teamwork and how to set goals. It's bound to get even the littlest voice in your car to open up, and who knows? You may even be inspired to start your own family podcast. Storynory presents original stories and classic fairy tales for a 7- to 10-year-old audience. Avoid music-related squabbles by taking turns playing DJ. On streaming music apps likeSpotify or Pandora, you can choose radio stations based on your favorite artist, and discover curated and theme playlists (including "Heartland Drive" and "Songs to Sing in the Car"). But if you're the driver, ask the person in the passenger seat to switch the tunes for you. The Family Car Games app ($1.99, iOS) contains instructions for 100 storytelling, guessing, creativity and other types of games. Remember Mad Libs? Now you can play the "fill-in-the-blank game" on your smartphone for free (iOS, Android). Or nurture your brain with the free FunBlast Trivia app (iOS, Android). Youngsters can connect to YouTube Kids on a tablet or smartphone to view kid-friendly videos. (Parents set children's age ranges and other security controls.) For teens and adults, Crackle, the streaming TV network, lets you watch hundreds of movies and TV shows for free. Before you hit the road, get a free (and fast!) quote on auto insurance from GEICO.